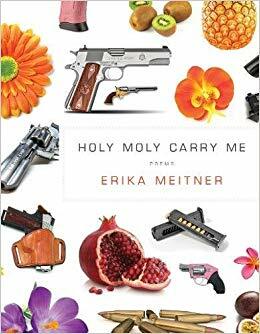 In Holy Moly Carry Me, Erika Meitner intertwines the personal and collective into a powerful examination of the 21st century. Associative poems braid together the terror of American gun culture, the Syrian Civil war, conservative American attitudes towards refugees and immigrants, the aftermath of the Holocaust, infertility, adoption, and parenthood to suggest that the struggles of our collective pasts will aid in understanding the contemporary moment. The collection’s speaker writes from a kaleidoscope of perspectives: a white, female poet; the child of of immigrants; a professor and parent concerned about mass shootings; a Southern transplant; a consumer of 24-hour news; and a Jewish American. In this review, I focus on what the Jewish aspects of the book reveal about the collection’s poetics of otherness, intercultural commentary, and American racial and ethnic dynamics. “Moses demanded the release of the Israelites from slavery, and led them out of Egypt and across the Red Sea” (9), “My mother was stateless until she was six” (11), “Holy holy holy is the Lord of Hosts. Holy holy holy is the Lord on High” (12), “And in his speech celebrating the 70th anniversary of the liberation of Bergen-Belsen, Ronald Lauder, a big macher in the World Jewish Congress said, When they begged for help, all they got was silence” (12), “Our entire country’s collective genesis: those who were persecuted, who survived, who fled” (12), “Girl Scout uniforms reminded / her of Hitler Youth” (25), “When my grandfather / came to America he made sweatshop hats,” (26) “Funny Girl” (27), “In the lab, they play / Spirit FM & don’t know anything about me” (28), “Second Avenue, / Delancey” (32), “their below- / the-knee skirts, the filled in parts / of their sheitels” (32), “Since we live in a small town // we are our own and only community” (34), “I am // neighbor and other” (39), “We are the only Jewish family in the / neighborhood, which isn’t a problem, except // around holiday time” (39), “On the bus, he told Brady / that Santa doesn’t exist” (45), “a story without an end in which they all came to America / to play cards & raise children—my grandmother, you should have seen her // at poker in her turban, North Miami” (50) “we were the same tribe // of survivors, a dream country everyday in this state of ocean & oranges & tattooed / Yiddish grandparents” (51), “What is hateful to you, do not do / to your neighbor, said Hillel. That’s it. / All the rest is commentary” (59), “the movable bookcase that served as the door & / entrance to the family’s hiding place. My innards” (56), “Rabbi Tarfon said it is not your responsibility to finish the work // […]He also said you are not free to desist from it” (73), “we also twist the orange bulbs / of my grandmother’s plastic electric on the sill” (82), “what’s in the box? The Holocaust, our grandmother’s // time in the camps” (84), “The Gemara says danger includes / all types of danger, like gentiles stealing lights or / throwing stones” (84), “The photos of broken glass; the piles / of rubble” (93). On a page of traditional Jewish commentary, layers of interpretation surround a central primary text. The commentary closest to the primary text might provide a close reading or clarification while the surrounding layers expand the discussion. The resulting dialogue expands outward chronologically from the primary text. While my example below is not intended to address this highly-complex system, I’m interested in the potentials of the visual layout and the ramifications of the resulting discussion. I’ve recorded my reading notes for “De Soto Park” (50-51), a previously-cited poem documenting a visit to the card-playing Jewish grandmother in Florida. This layout facilitates the reading experience and emphasizes the generative nature of the text—each reader can add on their own memories, questions, and disputes until a dialogue branches out. To find your own experiences reflected on the page: “I want to tell him I know this/exact moment, the one where you finally/learn the contours of your own face” (33). While I expect that many reviews will rightfully examine Meitner’s vital reflections on America’s gun culture, I want to focus on what might be a potentially overlooked-yet-timely meditation: her examination of American Ashkenazi Jews and race. Hana Wirth Nesher outlines the nuances of this relationship in Call it English: The Languages of Jewish American Literature (Princeton UP, 2006): “[R]ace and ethnicity in America have been redefined so that Jews are in the category of white Euro-Americans, which many of them feel does not reflect their history or contemporary self-definition. [This is because] they do not see themselves as a race, as their ethnicity is complicated by the fact that their countries of origin are not their cultural homeland, and as religion is not a significant cultural signifier in America (where faith is a private matter and shared across racial and ethnic lines)…” (162). In other words, for some American Ashkenazi Jews, their diasporic identity doesn’t map neatly onto American racial discourse. The poetry community is addressing these nuances—for example, in an August 2018 newsletter, Split This Rock announced that it’s adding “Jewish” as a database option under its Race/Ethnicity category. I am white, but my family is multi-racial—my youngest son is African-American, and I am raising both my sons as Jews. I am hyper-aware that I move through the world with white privilege, while my youngest son does not have the same privileges and protection. […] And certainly most (or all?) of my Jewish poems reflect a very particular (white) Ashkenazi Jewish-American experience and world-view shaped by bungalow colonies, summer camps, Hebrew school, Israel, Holocaust survivor family baggage, Yiddish, and the overwhelmingly Jewish (though predominately Sephardic) suburb of Long Island where I grew up. But Judaism in poems feels ethnic and outsider-ish to me still, as America is predominately Christian and getting more so by the minute (see: Hobby Lobby). Jewish poetry still feels like an ‘other’ thing—a minority thing, a thing many readers won’t identify with or can’t access (due to inaccessible language, or unfamiliar cultural or historical or textual references). The poem’s use of the New Testament term “Leviticus” rather than the Hebrew “Vayikra” clues the reader into the dominant Christian hegemony in which the poem operates. The poem quickly pivots to Hebrew, however, with “ray’ah.” The first two stanzas enact the opening of the third: “I am / neighbor and other.” The speaker code-switches between modes—between identities—while simultaneously inhabiting both. She is both a Jewish mother and a white mother, a neighbor and the other. The line between these identities is as fine as the American division between “Happy Holidays” and “Merry Christmas”—the thin line between small-talk and culture-war. Holy Moly Carry Me asks if we, as writers and readers, can document and consider various American minority experiences in their complexity without simplifying or silencing them. It is from this intersectional, liminal perspective that this collection carries its 21st-century readers from despair to resiliency. Allison Pitinii Davis is the author of Line Study of a Motel Clerk (Baobab Press, 2017), a finalist for the National Jewish Book Award’s Berru Award and the Ohioana Book Award, and Poppy Seeds (Kent State UP, 2013), winner of the Wick Poetry Chapbook Prize. She holds fellowships from Stanford University’s Wallace Stegner program, the Fine Arts Work Center in Provincetown, and the Severinghaus Beck Fund for Study at Vilnius Yiddish Institute. She is a PhD student at The University of Tennessee.